You might wonder why I, as a woman who was single longer than I was married, and whose life as a divorcee is now longer than as a wife, might come and talk about what marriage should be. As a failure, perhaps I have no right to counsel those of you who have kept your relationships intact. 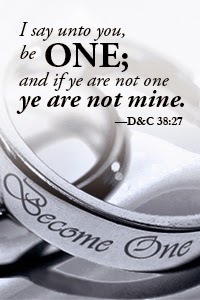 Since my own marriage (and even before,) I have watched all of you who are married. I have watched for signs that marriage can be what I think it is. I have found a few people who I believe live what God intended. But I have also found plentiful evidence that being married does not necessarily teach one understanding of marriage. Why, when those who agitate, prod, question and demand call us "TBM" as though belief is something shameful, do we turn around and label them as "Liberal Mormons," mock them with "clever" poetry, and pat ourselves on the back for not being like them? Are we so jealous of their position that we must toss away the better part of faith in Christ in order to join them in the work of destruction? Far better that we remember: obedience is unto righteousness, faith is unto the power to heal the brokenhearted, and exaltation can never be achieved without the pure love of our Savior coursing through our collective soul. If we cannot hang upon our own cross of public opinion and summon an outpouring of love for our accusers, we can never be the disciples of Christ that we think we are.